Introduction: Post-Operative Ileus (POI) is a common complication of abdominal surgeries leading to increased hospital stay and healthcare costs. Alvimopan is a novel agent in which competitively binds to peripheral mu-opioid receptor in the gastrointestinal tract. Following oral administration, alvimopan antagonizes the peripheral effects of opioids on gastrointestinal motility. Use of this drug during laparoscopic colon surgery may shorten hospital length stay by reducing the incidence of POI. Methods: A retrospective study was completed to evaluate the effectiveness of using alvimopan during laparoscopic colon surgery. Alvimopan (12mg) was administered to patients at least 30 minutes prior to undergoing colon surgery and the drug was continued during the hospital stay (12mg twice daily). The postoperative course was followed and return of bowel function and length of stay was recorded. Results: Thirty one patients underwent laparoscopic colon surgery during the period of Jan 1 2009 to Oct 1, 2009. BMI ranged from 25 to 40. The patients received one of four colon surgery (laparoscopic low anterior resection, laparoscopic right hemicolectomy, laparoscopic sigmoid resection, or laparoscopic colostomy reversal). The return of bowel function with regards to passage of flatus was 1-4 days (ave 1.4d). The full resolution of ileus with passage of stool was 1-5 days (ave 2.3d). The length of stay was 1-5 days (ave 2.5d). Conclusion: Alvimopan can be employed as an effective agent to significantly reduce incidence of POI with return of bowel function as quickly as postoperative day 1. This in turn reduces length of stay in the hospital after laparoscopic colonic surgery. 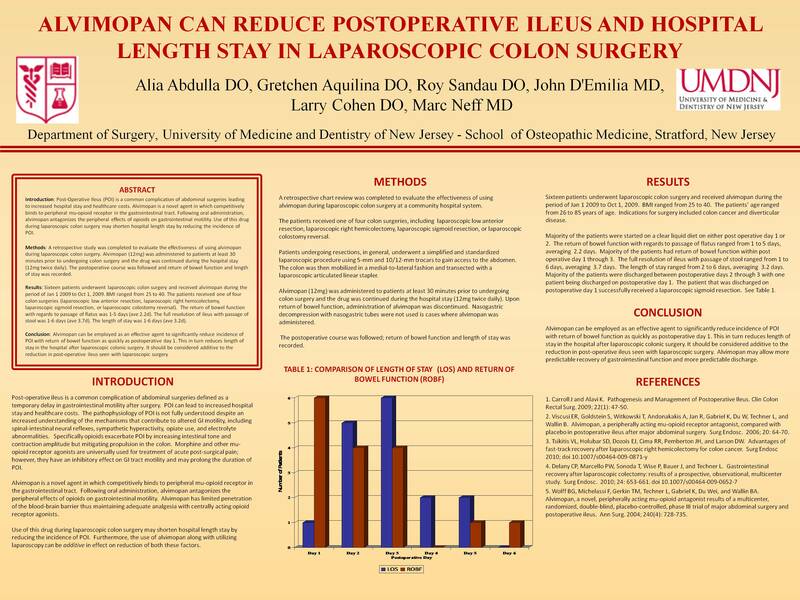 It should be considered additive to the reduction in post-operative ileus seen with laparoscopic surgery.